The eggs of these insects overwinter on the needles of various pine species where they are laid. The eggs hatch in the spring and the emerging larvae form compact masses on the branches. They devour the needles of previous years until they are fully developed. Mature larvae have black heads and greyish green bodies with dark stripes on the sides. 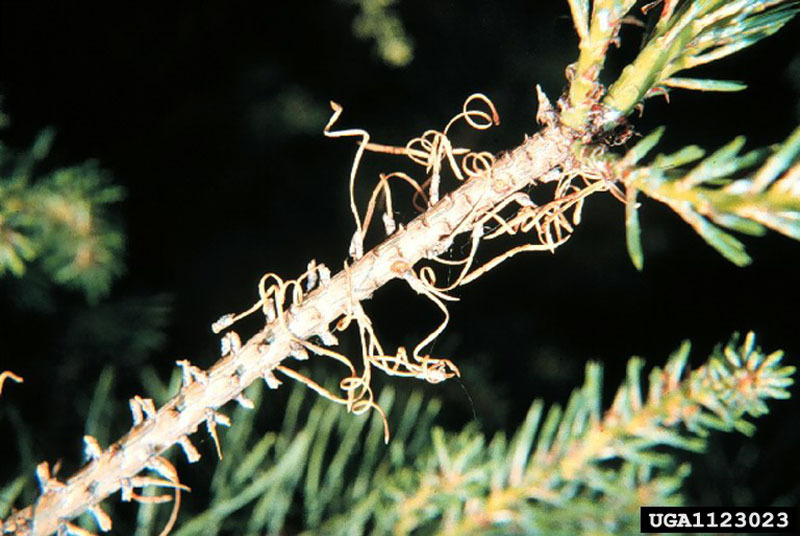 One of the initial signs of an infestation of European pine sawflies is withered, twisted needles that have been skeletonized by young larvae. In the case of severe infestations, all foliage, except needles of the current year, may be destroyed. 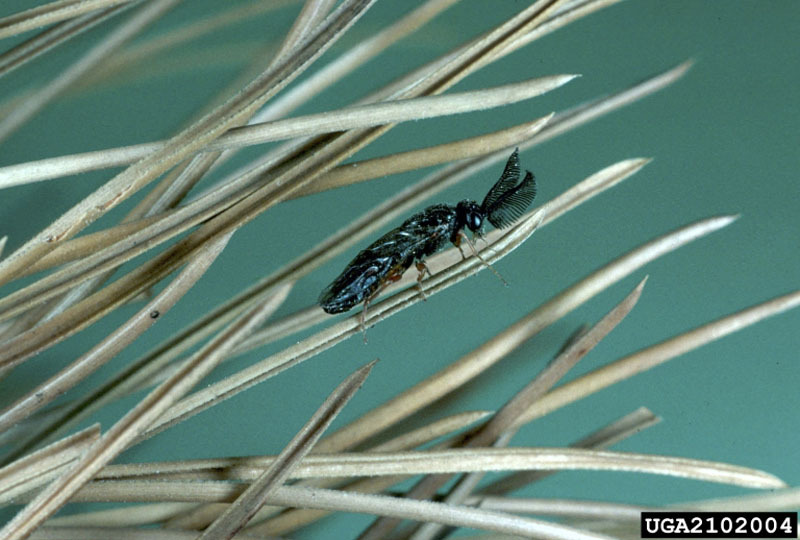 In certain parts of Canada, particularly in British Columbia and southern Ontario, European pine sawflies are considered a major pest because they attack Scots pine, a species grown in Christmas tree plantations. 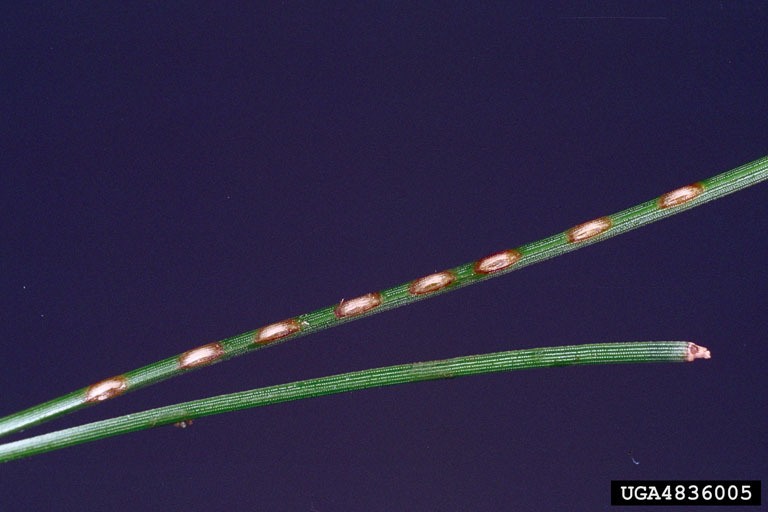 These insects can also inflict severe damage on plantations of red pine, which for many years have been a popular species grown in plantations. 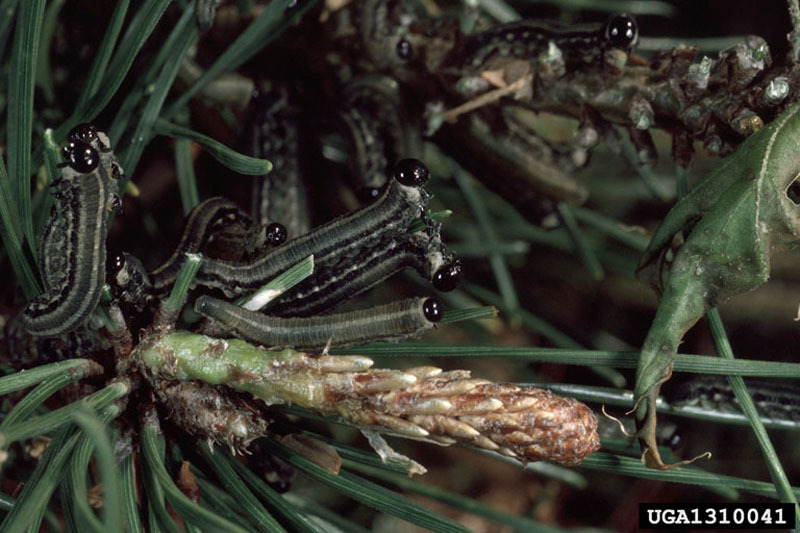 Pine trees used for landscaping purposes can also be defoliated by European pine sawfly larvae, which prefer to attack young open grown pines. These insects, originating in Eurasia, were discovered in the United States in 1925 and in Canada in 1939 in Windsor, Ontario. 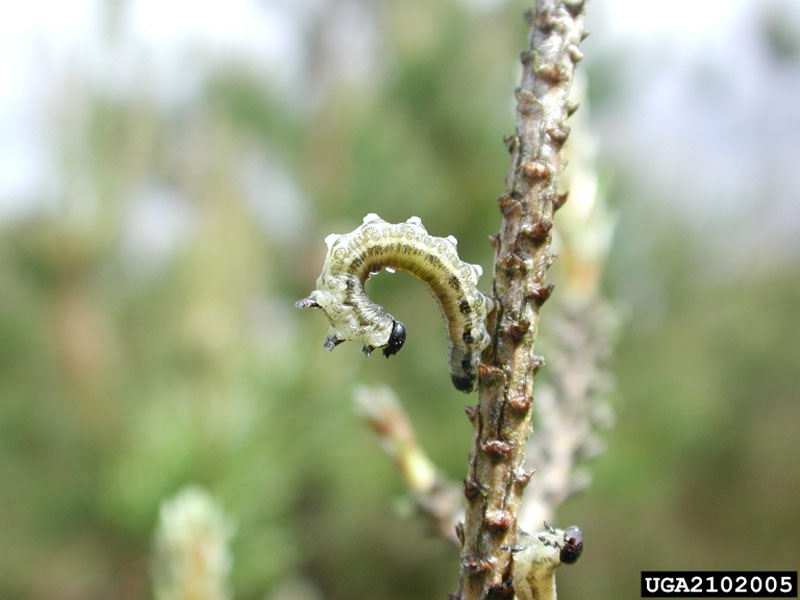 European pine sawflies are defoliator insects that attack several species of pine. Their activities make the trees they attack more vulnerable to other secondary pests, such as bark beetles. 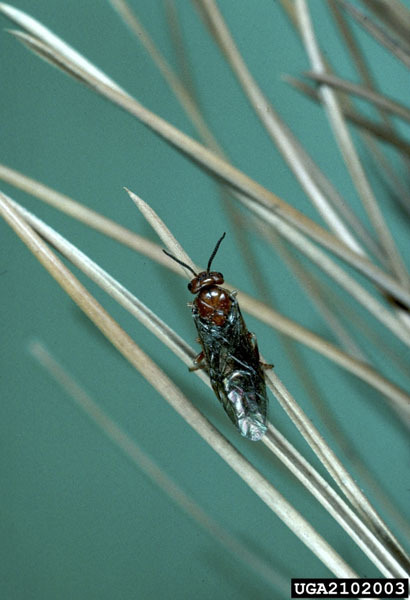 Fortunately, the growth of introduced European pine sawfly populations is usually limited by the activities of certain natural pathogenic organisms, particularly viruses, and of parasites, of which the most remarkable is also an introduced parasite species, Pleolophus basizonus. This virus is also used in applications for killing young sawfly larvae, just like a traditional insecticide. Ives, W.H.G. ; Wong, H.R. 1988. Tree and shrub insects of the prairie provinces. Can. For. Serv., North. For. Cent., Edmonton, Alberta. Inf. Rep. NOR-X-292. 327 p. + xii. Rose, A.H.; Lindquist, O.H. ; Nystrom, K.L. 1999. Insects of Eastern Pines. Nat. Resour. Can., Can. For. Serv., Ottawa. Revised edition. Publ. 1313. 128 p.